There has never been a greater opportunity for you to make a difference. We are addressing some of the most critical challenges of our time, and the demand for our graduates is strong. The School’s course of study emphasizes experiential learning, research with faculty, corporate and K-12 work, community service, and leadership development. The knowledge and solutions that are created today will shape our quality of life as well as future generations – we have an opportunity and an obligation to make our world more sustainable. Together, our faculty and students are addressing global challenges that include energy, materials and technology; water quality and supply; international development; ecosystems; social transformations; food and food systems; and policy and governance. Your investment in the School of Sustainability gives our students a broader perspective and a deeper ability to rethink and reinvent the future of a world at risk. The knowledge and solutions created today will shape our quality of life and that of future generations. We have an opportunity and an obligation to make our world more sustainable. A gift to the annual fund makes the biggest difference to our growing program. This fund allows us to create opportunities each year for our students – workshops, speakers, certification preparation, global experiences, or attendance at conferences — to prepare our students in a very personal way. When you give to the Opportunity Fund, you open doors and change lives. Your investment provides impactful opportunities for our students – internships, workshops, conferences, certification preparation, global experiences, and mentorship — to give our students a broader perspective and a deeper ability to rethink and reinvent the future of a world at risk. Help students succeed. Your gift will support competitive scholarships and fellowships that attract and retain outstanding students who wish to major in sustainability. Now is the time to make a steadfast promise of financial support to deserving students. Your support directly impacts a student’s ability to make the world more sustainable. 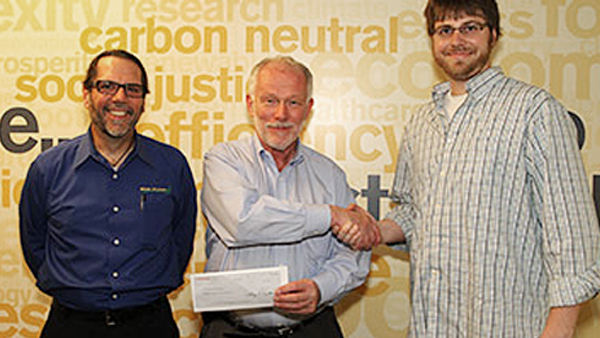 Research is a key component of any sustainability degree. The nation’s first School of Sustainability offers students at every academic level the opportunity to work collaboratively across disciplines. By applying classroom concepts to real-world scenarios, sustainability students find solutions to pressing environmental, economic and social challenges. 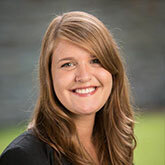 The SURE program offers a tiered approach to research opportunities for undergraduate students in the School of Sustainability that can also lead to internship and study abroad possibilities. Your contribution helps us develop innovative ideas and solutions to the many challenges of current food systems. Your gift supports a broad range of activities at the Swette Center for Sustainable Food Systems and empowers the work of 60+ faculty members along with staff and students, all of whom are engaged in food-related work dedicated to achieving the United Nation’s Sustainable Development Goals by creating and disseminating knowledge about food systems that drive economic productivity and social progress. 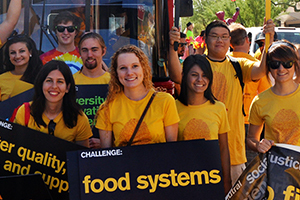 Over 300 faculty members across ASU have joined our circle of Sustainability Scientists and Scholars, recognizing their teaching and research in sustainability in engineering, business, humanities, design, nutrition – you get the idea – will be stronger if we work together. There are a number of ways your gifts can strengthen sustainability faculty, from nurturing and rewarding early-career professors to attracting an industry leader to serve as an Executive-in-Residence for a day or for a year. Awards for distinguished senior academic leaders are also deeply valued as are funds to support the research and teaching activities of key faculty members. 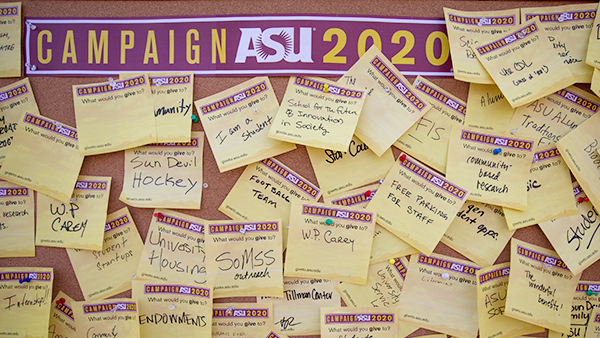 Campaign ASU 2020 will advance world-class initiatives that address the greatest sustainability challenges of our time in education, food systems, biomimicry, energy and society, and sustainable communities. 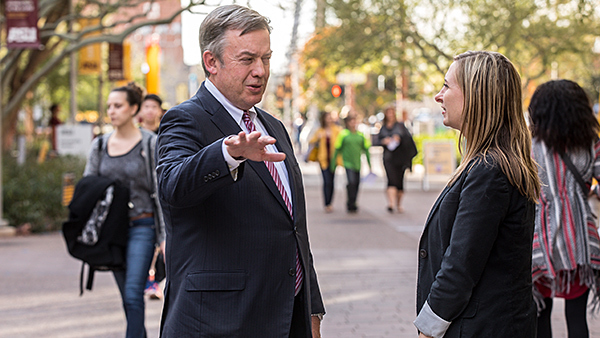 With your help, we will build on ASU’s power to convene partners who will focus on use-inspired solutions with our world-class network of sustainability scientists and scholars.